Over the past couple of years of planning for the AT, I’ve done a number of day hikes and multi-day backpacking trips. I’ve also read a lot of books detailing the author’s thru-hike and lessons learned on the trail. Whatever trail they happen to be writing about, there seem to be a lot of common themes, and I’ve begun to recognize these themes in my own hiking experiences, even though I haven’t started my thru-hike yet. Here are 3 things I’ve started to learn from my time on the trail. Last year, from January to November, I participated in the 52 Hike Challenge as a way to keep track of my hikes. It was fun to post a picture from each one on Instagram and tag it with the hike number until I hit 52 in November. It also helped motivate me to get out in all sorts of conditions every chance I had. Between that and walking 3 miles each way to work, I was out in temperatures between -8 and 94 degrees Fahrenheit. I was besieged by mosquitoes (which led me to buy a head net), dive-bombed by the biggest flies I’ve ever seen, and picked more ticks off of my socks on one hike than I had seen in my previous 40 years of life. I walked on blistered feet and with ankle, hip, and shoulder pain. I learned what pain was normal for my body when I was asking it to carry a heavy pack for miles, and I learned to focus my attention on other things… or at least try. There will always be times when the pain or bugs or heat are overwhelming, but when every single blade of grass along the trail had a tick on it waiting to leap onto me, at some point it became just a freaky part of the scenery, especially after I noticed they were falling off when they tried to climb up my permethrin-treated pants. It didn’t stop me from internally screaming whenever I saw another tick climbing on me, but accepting that this was just my life for the next couple of hours did stop me from completely losing it. I’m definitely not saying that you should try to ignore or accept every discomfort on the trail, though. There are plenty of times when being uncomfortable is a big flashing sign that you need to stop and take care of something, and it’s important to recognize those times. Especially when it involves your feet. On a particularly mosquito-ridden hike, before my head net arrived, I found myself sloshing around with wet socks, the kind that make a squelching noise with every step. I had already hiked about 7 miles and chosen to not break for lunch lest I be devoured myself before I could devour my food, but I was starting to notice uncomfortable hot spots where my water-saturated socks rubbed against my heels with every step. 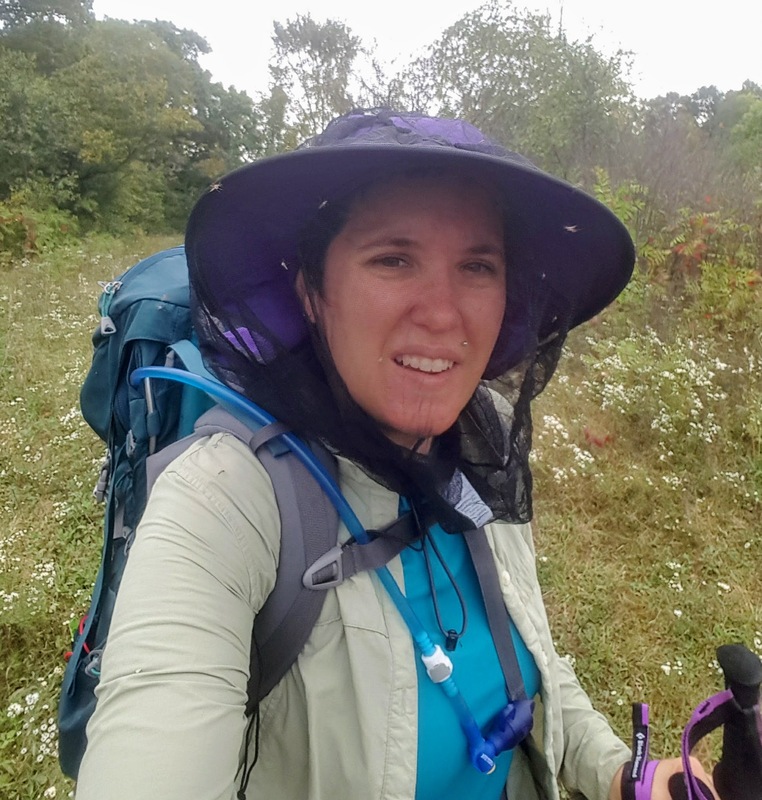 When I get into go-go-go mode, it’s very hard to turn it off and stop for anything, but I knew that I had to choose between a few minute delay with the possibility of a few itchy mosquito bites or the certainty of blisters that could make the rest of my hike very unpleasant. I opted to wait to reach a bench near a parking lot where the mosquitoes were slightly less aggressive than in the woods, but I did finally stop. I set my pack down next to me on the bench. I stretched my shoulders and breathed a sigh of relief. 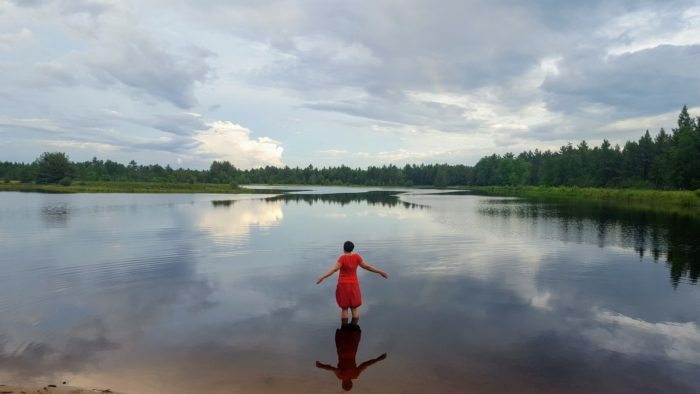 I sat down and wrung out my socks, reveled in my bare feet for a few seconds before the mosquitoes discovered them, and then put my socks and shoes back on and headed out, refreshed and relieved from just those few minutes of rest. My feet were fine for the rest of the hike. It was hard to stop for even that short time, but once I did it, I knew I’d made the right choice. When I was very young, I remember my grandparents gently explaining to me that a friend of the family had died after accidentally sitting on the wrong log, one that was home to a colony of bees who stung her repeatedly in self-defense. Since that day, I’ve gone out of my way to avoid bees. 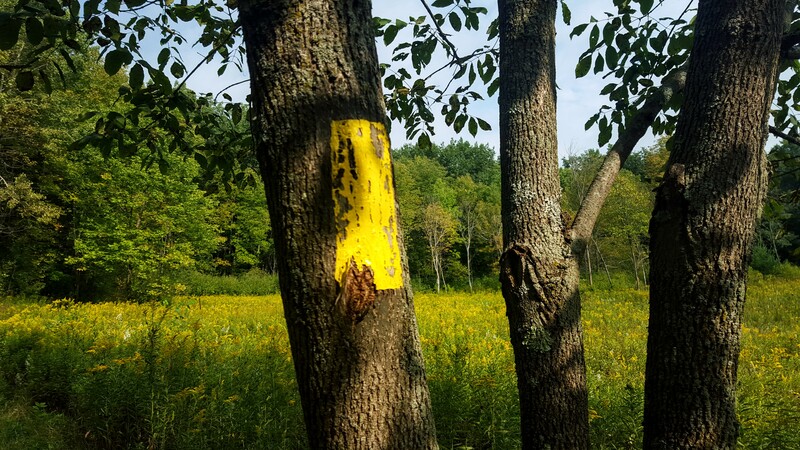 However, in the fall of 2015, I found myself hiking through big fields of bright yellow goldenrod growing so tall they drooped over the trail, flowers covered in bees that I couldn’t avoid.I stepped into the first golden, buzzing field while it was still morning. I was planning on hiking until late afternoon and I didn’t want to let a field of bees stop me so early. I was relieved and proud when I safely put the field behind me and entered the woods. I thought I had made it through. Then, a few miles later, there was another field filled with the same bright yellow flowers and an equally huge number of bees gathering pollen from them. By the time I got to the third field, I realized that since I would have to pass through both previous fields to get back to where I had started, I might as well just keep going forward to the arranged pickup location miles ahead. I don’t remember how many fields the trail passed through that day, but it seemed like there was one every few miles. And I just had to keep on going. As I made my nervous way on the narrow path between the flowers in each field of bees, I found myself focusing on a mantra running through my head as if I were trying to communicate with the bees “I’m just passing through.” In reality, the bees took very little notice of me and were just going about their business. The thing I’d really been up against all day wasn’t the bees, but my fear. This is an experience I think of frequently when trying to push through fear in my daily life. Avoidance can be a very a tempting option, but I remind myself that if I choose that option, I won’t keep moving forward and I’ll never get through it. It was the third day of a 4-day backpacking trip in November. I had just spent my first 2 consecutive long, dark nights in the woods and was feeling at my most uncertain and lonely. When hiking on the Ice Age Trail, it’s not unusual for me not to see anyone for the entire day. However, on this particular day, I ran into just the right people. The first was from a Facebook group, of which I am a member, for people section hiking the Ice Age Trail. She was extremely friendly, and while we were talking, a young woman who had spent the previous night alone at the campsite where I would be arriving in a few hours joined us. We all stood in the middle of the trail chatting for about 15 minutes, and contrary to my normal introverted nature, I felt energized by the contact with these fellow solo female hikers. Later, while I was eating lunch, a woman with a dog stopped to chat with me. She was a local and filled me in on a place just a little past the next road crossing where I could stop to charge my phone battery, which I had been afraid I would have to rigorously conserve until the next day to make sure I could arrange pickup. I finished up my lunch feeling grateful for the information and less apprehensive about the coming night, but I still had concerns sneaking into my thoughts about whether I could really complete a thru-hike when I was struggling on just my third day of this trip. As these looming doubts and worries started to take over, I almost immediately ran across a little white-haired woman in a bright orange Halloween-themed shirt sitting on a log eating her own lunch. We struck up a conversation, and it turned out that she had hiked most of the AT. 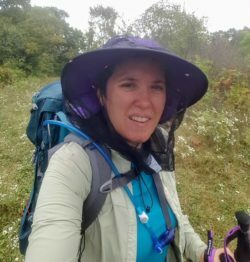 I hinted at my concerns, and she enthusiastically proclaimed that if I had a chance to thru-hike the Appalachian Trail I should absolutely go for it and it would be more amazing than I could imagine. I hiked on with my spirits considerably lifted. Of course, I still wound up having a crappy night, but the encounters the trail had given me that day helped me get through it. While I lay in my hammock in the dark listening to disturbing noises, I reassured myself by thinking of how the young woman I met had stayed there safely the night before. With my fully-charged phone, I was able to send the friendly Thousand Miler WannaBes member a note letting her know how much I had enjoyed meeting her, as well as messaging my partner for support and encouragement. And when my fears and worries threatened to overwhelm me, I thought of my encounter with the old woman who seemed to have been put on my path specifically to reassure me that I was headed in the right direction and could reach my goals. I can’t wait to see how much more the trail teaches me once I finally start my thru-hike! Amazing post, Kate! Loved your writing style!